With Spring Training in Dunedin, FL just a few weeks away, the Blue Jays announced their internal non-roster players that will be invited to Major League camp. 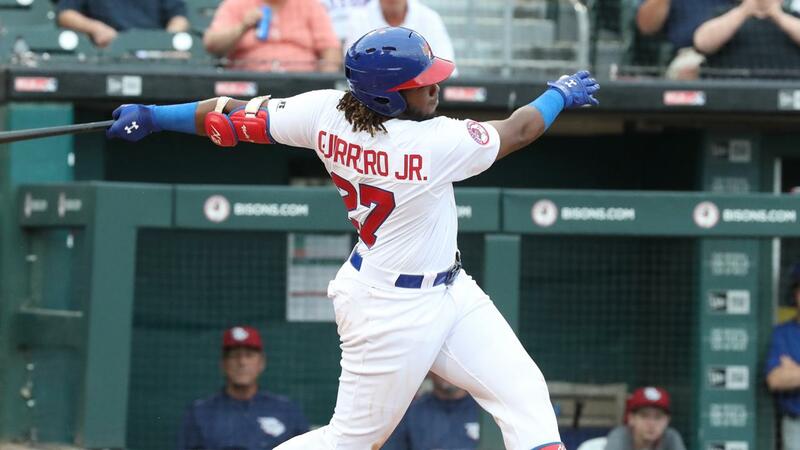 To no surprise, Vladimir Guerrero Jr., the top prospect in all of minor league baseball, is among the 15 players that have been invited by Toronto to start camp on the big league side. Other players who are on the list and appeared with the Bisons in 2018 are reliver Justin Shafer and starter Shawn Morimando. The list also included the Blue Jays' #2 rated prospect, infielder Bo Bichette, and 2018 Eastern League MVP, infielder Cavan Biggio. Both players appeared in Buffalo during the Bisons recent Hot Stove Prospect Showcase. Guerrero's monster 2018 season included 30 games with the Bisons, starting with the final day of July. He hit .336 with six home runs, 16 RBI and 15 walks to only 10 strikeouts. He homered in four consecutive games, August 8-11, at Sahlen Field. Shafer was the Bisons' saves leader in 2018, converting 15 of his 16 chances to go along with an impressive 1.41 ERA. He was 3-3 in a team-best 34 appearances. Morimando joined the Bisons in August and went 1-3 over four starts with a 4.50 ERA and 11 strikeouts in 20 innings or work.